Europe's most ancient relics actually lie on Malta, the Mediterranean island nation just south of Sicily. Carbon dating has revealed that the Ggantija temples outside the rustic village of Xaghra (Maltese names are tricky because the language is an amalgam of Arabic, Latin, and Greek) are roughly 6,000 years old, making them some of the oldest free-standing structures on Earth. Though the Acropolis and Stonehenge have captured the imagination of tourists since grand tours of "the continent" were in vogue, Europe's most ancient relics actually lie on Malta, the Mediterranean island nation just south of Sicily. 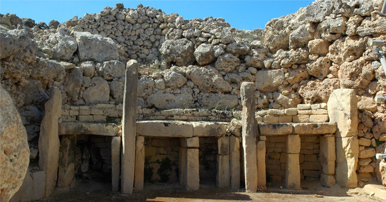 Carbon dating has revealed that the Ggantija temples outside the rustic village of Xaghra (Maltese names are tricky because the language is an amalgam of Arabic, Latin, and Greek) are roughly 6,000 years old, making them some of the oldest free-standing structures on Earth. And traveling to them, a trip through the graceful capital of Valletta and across a narrow strait of bright blue water to the farming island of Gozo, is itself a joy. Malta has changed so little over the centuries that it's regularly used as a backdrop for major motion pictures, such as 'Troy,' 'The Count of Monte Cristo,' and 'Alexander,' that need timeless landscapes. Ggantija, newly named a "Heritage Park," stands eternal guard on a rocky plateau amid stone-walled olive groves. Built between 3,600 BC and 3,000 BC (the site has a millennium on the Pyramids), the 17-foot-tall structures are henge-like but buried beneath small, sun-bleached stones. Wandering through the ruins is a surprisingly powerful experience - in no small part because they are unexpected in a way that the overexposed Parthenon could never be. Fifty-ton stones are piled on top of each other and lined up like dominoes waiting to fall. "This explains the name Ggantija," says Dr. Reuben Grima, an archaeologist from the University of Malta. 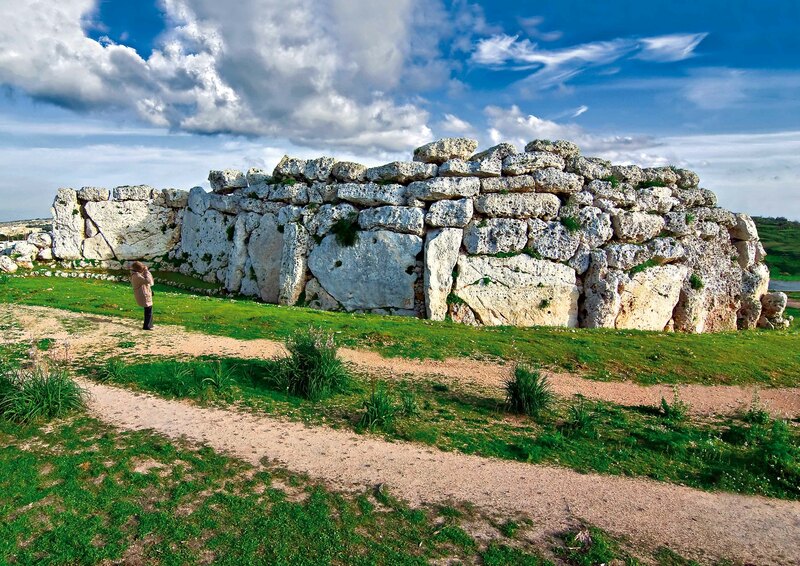 "According to Maltese folklore, it was once the belief that only giants could actually have built such temples." The giant builders theory may have been debunked, but the riddle remains. No one knows exactly who built the site, though the smart money seems to be on Neolithic farmers, who spent their days sowing barley and their nights down at the local fertility cult. Though the ruins have eroded over the millennia - sea salt and limestone are not the most compatible of elements - it is clear that the place once resembled a sort of seedpod full of round rooms. Warm sirocco winds from the Sahara whistle through the main corridor, which conceals five curvaceous chambers said to symbolize the female form. It's inside these secret apses (once roofed but now baked bare by the Mediterranean sun), where it's believed prehistoric priests conducted religious rites beyond the range of peering plebeians. Altars and stone hearths indicate the possibility of ritualized animal sacrifice. Experts like Dr. Grima suspect that ancient sites remain hidden around the islands, which are as riddled with caves as they are infested with film crews. Ggantija hasn't had its closeup just yet, but it inevitably will. Maybe then it will finally and deservedly join Europe's ancient A-list.